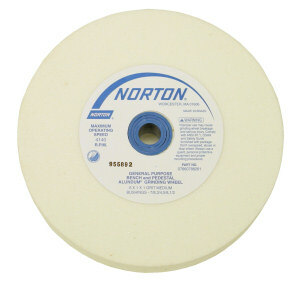 The Norton White Aluminum Oxide Grinding Wheel is the standard for grinding cutting tools such as chisels and plane irons. Unlike the gray wheels that come with most bench grinders, these wheels help keep your tool much cooler. 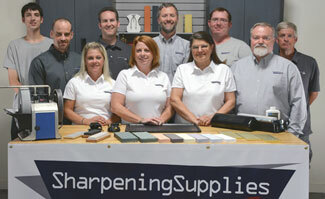 By running cooler, your tool doesn't overheat and weaken your cutting edge. Our medium 60 grit is a good way to grind your initial bevel. Our 100 grit provides a finer edge. The very fine 150 grit is the finest grinding wheel we carry. After grinding, a few strokes on a bench stone and your tools are ready for use. This wheel is a J Grade. The 8" wheel has a 1" arbor hole with bushings for 7/8", 3/4" and 5/8" arbors. The 6" wheels have a 1" arbor hole with bushings for 7/8", 3/4", 5/8" and 1/2" arbors. Rated at 3600 rpm. Q. What do you recommend to dress these wheel? A. The Norton Dressing Stick works well to dress this wheel. The diamond dresser isn't necessary for this wheel type. Q. How cool does this wheel run? A. This wheel run cooler than most wheels. The J Grade indicates that is is harder than the an I grade (a soft wheel) and less hard than the K (a hard wheel). As with any wheel, keeping it properly dressed keeps it running properly.